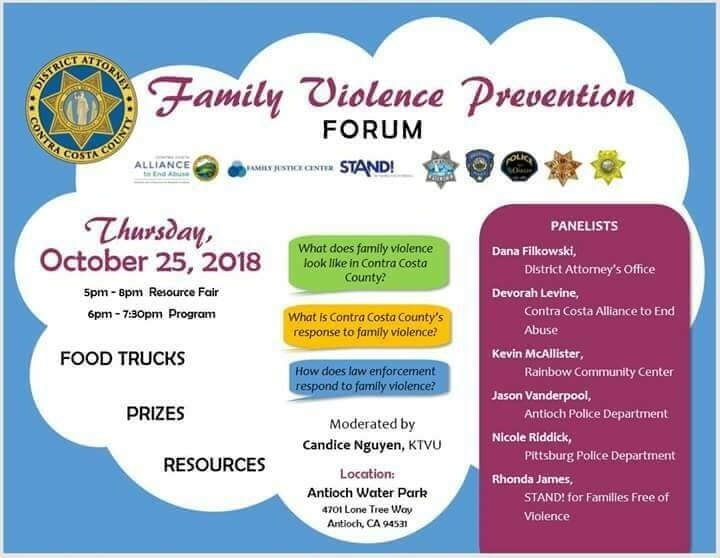 On October 25, the Contra Costa County District Attorney’s Office along with our justice partners, is hosting a community forum and resource fair which will address what family violence looks like in Contra Costa County, what Contra Costa County’s response is to family violence and how law enforcement responds to family violence. Victims may feel conflicted about reporting violence in the home or may not be aware of the wide range of resources in our community that can respond to, intervene in and work to prevent these issues and keep our families safe. 32.9 percent of California women and 27.3 percent of California men experience physical violence, sexual violence and/or stalking in their lifetimes. In 2016, the National Domestic Violence Hotline received over 28,000 calls from California and nearly one-third of these had children in the home. Research has shown that only 4 percent of domestic violence murder victims nationwide had ever availed themselves of domestic violence program services. Our goal is to increase that number by letting our community members know how to get help right here in Contra Costa County. The event will occur in Antioch at the Antioch Water Park (4701 Lone Tree Way) starting at 5:00 p.m. with the resource fair. Community members will receive a “passport” to use when visiting providers at the resource fair and will be eligible for prizes if they collect a “stamp” from each provider. A blue ribbon panel of experts from many levels of our County’s family violence response system will address the audience at 6:00 p.m. and be available for questions. After the panelists finish, the resources fair will be continue until 8:00 p.m. Food and drinks will be provided. Victims of family violence can get help by reporting the conduct to the police, by calling the STAND! for Families Free of Violence 24-hour toll free crisis line at 1-888-215-5555 or contacting the Family Justice Centers in Richmond (256 24th St.) or Concord (2151 Salvio St., Suite 201). In any life-threatening emergency, victims should always call 911. In 2019, a new Family Justice Center location will open in Antioch to serve East County residents. · Ombudsman Services of Contra Costa, Inc.
October is National Domestic Violence Awareness month. This entry was posted on Thursday, October 18th, 2018 at 7:47 pm and is filed under Community, Police & Crime, Children & Families. You can follow any responses to this entry through the RSS 2.0 feed. You can leave a response, or trackback from your own site.